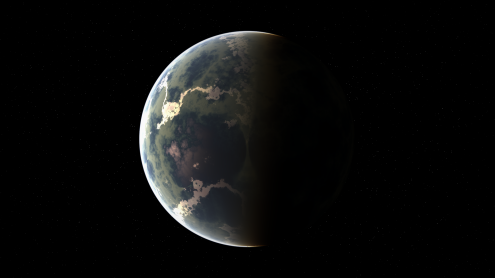 And the crazy thing is - because it's fractal you could ACTUALLY create the terrain for this exact planet if atmospheric flight/exploration ever becomes a feature. I know it has been over a year but I stumbled across your blog and I am really impressed with the results of your scattering algorithm. I have an atmospheric scattering implementation that is based off the same GPU Gems 2 O'Neil article but my algorithm is too slow. You said in an earlier post that you were able to simplify the algorithm to around 15 lines which is pretty incredible. Are you still planning on posting this algorithm? Or potentially any high level simplification that worked well for you? Any insight you might have on how to simplify this algorithm would be greatly appreciated. Thanks.